A Perl 6 implementation of the GraphQL standard. 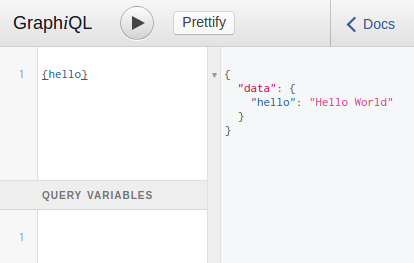 GraphQL is a query language for APIs originally created by Facebook. The server takes any GraphQL query sent with HTTP POST to /graphql, executes it against the GraphQL Schema, and returns the result in JSON. There is one additional feature. If it receives a GET request to “/graphql”, it sends back the GraphiQL graphical interactive in-browser GraphQL IDE. You can use that to explore the schema (though the Hello World schema is very simple, that won’t take long), and interactively construct and execute GraphQL queries. You can mix/match with other routes you want your server to handle. Pass in your GraphQL schema, and optional :graphiql to enable GraphiQL support on an http GET. See eg/usersexample.md for a more complicated example. See slides from a presentation about Perl 6 GraphQL at the Philadelphia Perl Mongers. Copyright © 2017 United States Government as represented by the Administrator of the National Aeronautics and Space Administration. No copyright is claimed in the United States under Title 17, U.S.Code. All Other Rights Reserved.